Of all those horror soundtracks I’ve got in my collection, one of my favorites has to be Rob’s Maniac Soundtrack. It’s filled with all that 80s synth goodness, slick production, eerie moments, and mournful bouts of melancholy. You know, all those things that get the girls all hot and bothered. Am I right? Huh? Okay, so it’s not party music. You’re not doing jello shots and beer bongs to songs like “Haunted”, “Headache”, or “Boum”. You could be getting down to something like the last track, “Juno”. It’s dance club ready. But, most (sane)people would just put on some Nicki Minaj or Taylor Swift or Pharrell Williams if they want some party music. Not me. Me: Oh, so you guys want some good time jams? Ever hear this one? Party guest: Isn’t this the soundtrack to that movie where Frodo Baggins scalps beautiful women? Yeah, I sort of obsess over the horror soundtracks. I’m sorry. Some people get all nostalgic and reminisce over a ball game in the summer of 1985, or over some great memories of high school. Or some awesome vacation to Key West with their family when they were 9. Not me. I reminisce about the summer when I first saw George Romero’s Dawn of the Dead. Or when my parents took my brother and I to see Fright Night in 1985. Or Silver Bullet. Or Nightmare on Elm Street Part 2. Or, the time my best friend and I stayed up all night because we were so freaked out after watching the movie Maniac. I think we were 14 years old. My mom and dad went out for the night so my best friend and I rented the infamous 1980 slasher flick starring Joe Spinell and directed by William Lustig. We knew it was supposed to be gory and a little disturbing, what with all the scalping and the guy sweating profusely throughout. Well, it was everything we thought it would be and more. Tom Savini’s effects, the overall creepiness factor of Joe Spinell, and those mannequins….those damn mannequins. Suffice it to say, this movie lived in infamy in the memories of my best pal and I for years. A few years ago as a gag I bought a VHS copy of Maniac for my buddy for his birthday. We bought plenty of beer and proceeded to watch this movie that meant so much to us for years and were very underwhelmed. Maybe it was the beer, or maybe the passage of time, but the movie was pretty stupid. It was creepy, but for all the wrong reasons. We rewound the tape and never watched it again. We never even talked about the movie again until we heard about the remake. Yes, a remake to the infamous Maniac. And not only that, but it starred Elijah Wood as the serial killer Frank Zito. It was directed by Franck Khalfoun, and written and produced by Alexandre Aja. Nostalgia alone was enough for me to want to see it. A beer night was set and once again my best pal and I sat down to watch Maniac, in remake form. I was impressed. It was very well made. Dealt more with the psychosis of the main character. His reasoning for doing all the horrible things he did. It was beautifully shot, acted, and the soundtrack was amazing. I liked the music so much that when I saw Death Waltz Recording Co was issuing it on vinyl I knew I had to have it*. The score was written and performed by Rob. Who is Rob? Well, it turns out Rob is actually Robin Coudert. 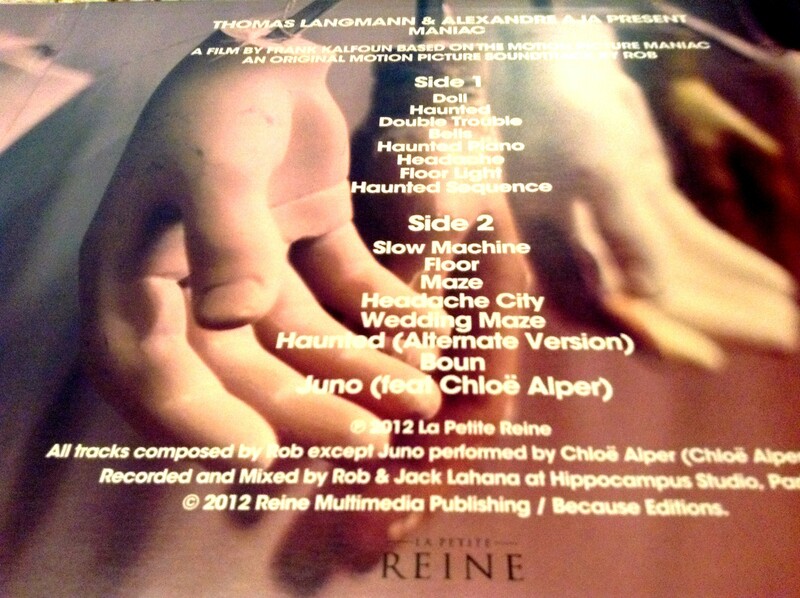 He does film scores and has worked with bands like Phoenix, Daft Punk, and Air. But as far as I can tell his most compelling music is on this wonderful vinyl. The score really gives an otherwise dark and disturbing film some serious emotional heft. It’s a synth-heavy score, very much in the vein of Fabio Frizzi and Walter Rizzati. The “Haunted” theme is a recurring piece of music that is used throughout in different forms. It really is a haunting and melancholy piece of music that I don’t mind hearing over and over. The score is mostly sad, emoting pieces, with the song “Boum” being the shortest, saddest, and one of the creepiest pieces of music I’ve heard in recent memory. It has the vibe of a haunted lullaby, which it then leads into the last track on the album, “Juno(featuring Chloë Alper)”. It’s a hell of a dance pop track, and quite the change from the rest of the album. From what I remember it’s during a great scene in the movie as well. I think there was dancing involved. And sweating. So yes, another horror movie soundtrack. It’s kind of my thing I suppose. I don’t go for all horror scores. There’s something particular I want in a soundtrack. A soundtrack can be great, but it’s not necessarily a great standalone record. Some are perfect for the film, during the film. But you can’t put it on the turntable at home and enjoy it. It’s gotta be a great standalone album for me to buy it. 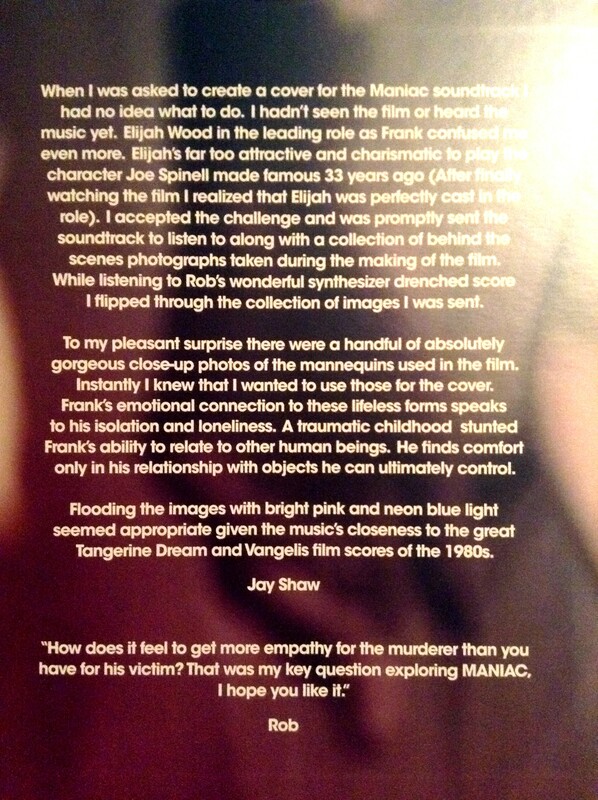 Rob’s Maniac S/T is a great standalone album. If I can sit in my easy chair, sip on a beer, and chill out to the soothing sounds of synth and strings then I’m good. If you’ve never seen Maniac and you can hack the mildly disturbing premise, I highly recommend giving this one a shot. You can skip the original, unless you’re a completist. * I actually owned the Mondo version of this score before the Death Waltz. I really wanted the Death Waltz version as I loved the the album art, but they weren’t selling it in the US at the time. I settled on the Mondo version, and it was just fine. It’s just that the album art, a painting of a pivotal and disturbing scalping of an unlucky gal, was something I didn’t really want to have to subject my kids to. So, I sold it to an acquaintance who doesn’t have any kids and I located a wonderful copy of Death Waltz’ version. I’ve spotted this on Netflix and can’t even say I’ve been that inclined to watch it. Had no idea it was a remake (haven’t seen the original). Anyhoo, I may hook it up this weekend (also plan to watch Paul if I can find it!) … as for the music, I’ll keep my ears peeled for that! If you like the horror genre is say give it a whirl, otherwise don’t bother. It’s a very well made and creepy film. Mall Cop. Never watched it. So you never found Paul? I need to see that myself. Love Simon Pegg and Nick Frost. Unfortunately not – I’ll need to have a look when I’m out and about for the DVD. Really enjoyed this review. I don’t think I’ve seen either version of the film, unusual for me that. So do you play this soundtrack after scalping each of your victims, or before? Neither. I play Iron Butterfly during the scalping stage. I play this one during the remorseful, guilt-ridden stage. I’m quirky like that. If you like this sort of thing I recommend both. I believe the original was on the “video nasties” list in the 80s. Not sure if the peaks your interest or detracts from it. The new one is really well done and tasteful…as tasteful as this can be. Can’t beat a tasteful scalping, I always say.